Walking back to your car after a day of fun only to find a parking ticket on your windshield can put a huge damper on your good mood- especially as a new driver. There are three steps you can take to avoid parking tickets. First, you must understand your city’s legal parking rights, as well as any city you are visiting. Second, know when to fight unfair tickets. And most importantly, know how to avoid tickets in the first place. Parking tickets are also referred to as parking citations, traffic tickets, and notices of illegal parking. In some cities/states, a traffic ticket is solely a penalty and represents a fine that must be paid, though the driver must often appear at traffic court to determine his/his guilt or innocence. In others, it also represents a deduction of driving points that will negatively affect a driver’s record. Either way, a traffic ticket must be reconciled. If it is not, you could be prosecuted or it could lead to civil recovery proceedings to settle the fine. To find parking information for your particular city, visit your city’s government website. There should be a “Parking Division” section (or other section similarly named). Here, all of your city’s applicable parking rules and regulations will be listed. The site should also list information about parking facilities, parking bans due to weather or special events, overnight parking, how to pay your parking ticket and whom to send it to, and parking meters. City parking laws make certain that city streets remain accessible and safe for the entire community, control availability and turnover of parking for businesses, visitors, citizens, and customers, and make sure that parked vehicles do not interfere with street operations and maintenance. If you have any questions about parking laws, contact your city’s Parking Division by phone or in-person, or ask your local DMV. Check all parking meter information. Meters should always show any parking restrictions, as well as the hours you will need to pay to park. Always keep change in your vehicle. This is especially important if you often park in a city with meters that require change. Extra change can always keep your meter from expiring and save you from a possible ticket. Quarters are accepted on all parking meters, so they are best to keep around. Some machines also take nickels and dimes. If there are no meters, be sure to read all surrounding signs for applicable parking restrictions. These should tell you what times parking is and is not allowed and can include both temporary and permanent signs. Remember, residential areas often have as many rules as commercial or downtown areas. You can also receive a parking ticket in these places. Be sure to check for “Resident Only” parking restrictions. Keep clear of all bus zones and fire lanes, as well as the area surrounding fire hydrants. These areas are certain to earn you a parking ticket. These places could also get your vehicle damaged in the event of an emergency. Always get a parking tab or receight when parking in a monitored lot. 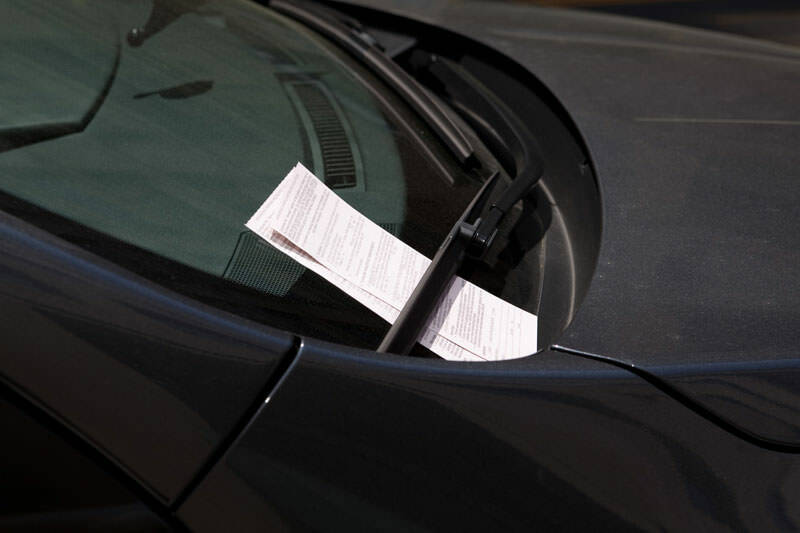 Receipts are usually placed visibly in your windshield to evade towing or tickets. Do not park close to intersections or corners. Most urban areas have additional restrictions in these areas for pedestrian crossings and clearance purposes. Understand the difference between “No Stopping” and “No parking.” A “No Parking” designation means you are allowed to enter the zone for as many as five minutes to unload or load passengers, but “No Stopping” areas do not even allow this. You can get a ticket for this even if you’re still in the vehicle. If you are unfortunate enough to actually receive a parking ticket, there are ways to fight it, though this usually involves disputing the charges in court. You’ll have to research exactly how this works in your particular city and state (and possibly even the area where you received your citation), but there are some general rules. First, you must plead not guilty and state your case before a jury or judge, but you must first notify the court of your decision to do so. Usually, traffic tickets show a specific court date or deadline by which you must act (by paying a fine) or by making a court appearance. You absolutely must stick to this date so that you will not incur additional penalties and/or fines, which can include license suspension or default judgment. In some cities/states, ignoring your parking ticket deadline could even result in a warrant for your arrest. If you do plan to fight your ticket, you should start preparing for your case as soon as possible and learn as much about the proper court techniques as you can.